Product Descriptionamiibo are a series of character toys that interact with games on the Ninte..
amiibo are a series of character toys that interact with games on the Nintendo Wii U and.. Edition:Bowser amiibo are a series of character toys that interact with games on the Ni.. 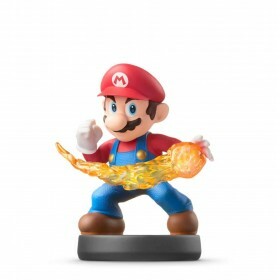 Edition:Mario amiibo are a series of character toys that interact with games on the Nin..
amiibo are a series of character toys that interact with games on the Nintendo Wii U and 3DS; When..
Made for Play! Discover New Characters, Explore New Game Modes, and So Much More! You can ..
Color: Bowser | Edition: Super Smash Bros. Team up with your am.. The protagonist of FINAL FANTASY VII, Cloud wields the enormous Buster Sword, a memento from hi.. Edition: Donkey Kong FIGURES SHOWN NOT ACTUAL SIZE AND DESIGNS MAY VARY .. Edition: Fox FIGURES SHOWN NOT ACTUAL SIZE AND DESIGNS MAY VARY Tea..
Yoshi's Woolly World Series amiibo Green Yarn Yoshi..
Inkling boys hail from the city of Inkopolis in the Splatoon series Made for Play! Discove..
Inkling girls hail from the city of Inkopolis in the Splatoon series Made for Play! Discov..
Color: Inkling Squid amiibo squid (Splatoon series) .. In the Splatoon series, the main characters, Inklings, can instantly transform into squids! We&.. Edition: Link FIGURES SHOWN NOT ACTUAL SIZE AND DESIGNS .. Style Name:No.53 Smash Lucas The younger of twin brothers living in Tazumili V..